Up to 80 per cent off clothing and accessories by celebrated Australian and international designers. Shop for a good cause! Up to 80 percent off clothing and accessories by celebrated Australian and international designers. All profits raised go to the charity Dress for Success Sydney. 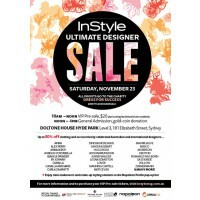 Want first access to the InStyle Ultimate Designer Sale? Make sure you purchase a VIP Ticket for $20! 1. Exclusive, early access to the sale from 10am – midday. 2. First dibs on everything! 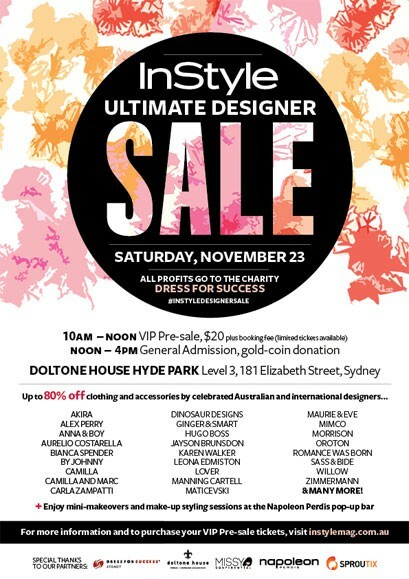 There are over 90 brands, including Willow, Sass & Bide, Lover, Alex Perry and Akira, and some exclusive celebrity pieces. Don’t miss out with a VIP ticket. Akira, Alannah Hill, Alex Perry, Anna & Boy, Aurelio Costarella, Bec & Bridge, Ben Sherman, Bianca Spender, By Johnny, Camilla, Camilla and Marc, Carla Zampatti, Charlie Brown, Collette Dinnigan, Free People, Gary Bigeni, General Pants, Ginger & Smart, Green with Envy, Hugo Boss, Incu, Jayson Brunsdon, Jigsaw, Kookai, Lover, Manning Cartell, Maticevski, Maurie & Eve, Max & Co, Michael Lo Sordo, Mimco, Oroton, Swarovski, Talulah, Thurley, Tigerlily, Viktoria & Woods, Willow, Zimmermann & many more.